Can you confirm these amateur observations of Scincus scincus? Type locality: “in montosis Lybiae, Aegypti, Arabiae petrae”. Types Syntype: NRM 141a (as holotype, by Arnold & Leviton, 1977), presented Envoy Baron Brinkman, 1.ix.1838 (fide Anderson, 1900). While this specimen has been previously identified as the holotype, Linnaeus' description is also based on a number of literature records (Gronovius, 1756; Seba, 1735; Bessler & Bessler, 1716; Olearius, 1674; Ray, 1693; Hasselquist, 1751, 1757), and the specimens that are the basis of those literature records are also syntypes. Only NRM 141a has so far been identified as a type specimen of this species. Diagnosis Diagnosis of the genus Scincus (fide GRIFFITH et al. 2000): Heavy limbs with robust pes, expanded lamellae on digits and phalanges, short-tailed. Conical head, convex in lateral view, parietal bone with clear lateral indentations and supratemporal fontanelle open. Sexual dimorphism in head proportions not distinct. Spatulate rostrum supported by extended fused premaxillae. 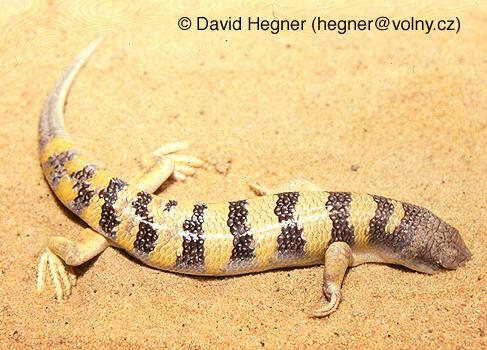 Strong ventrolateral keels running from upper labial scales to sacral region (convergent with other genera of sand-swimming lizards). Scales thick, separated by deep sutures. Two loreals, second fused with first of two presuboculars. Postnasal present. Palpebral and superciliary scales separated by groove. Usually four or five pairs of nuchal scales. Broadened mid-dorsal scales, mid-dorsal rows not fused. 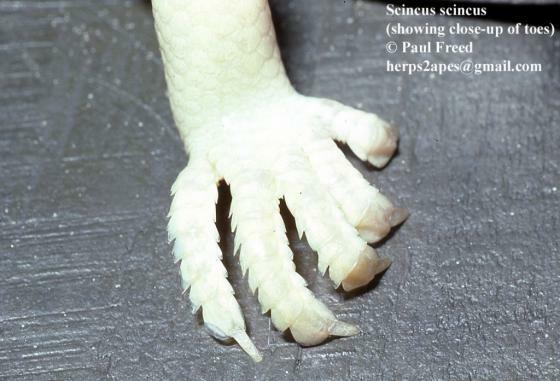 Medial preanal scales enlarged, lateral edges coincide with ventrolateral keels. Small, ventrally directed ear opening covered by several overlapping lobules. Color pattern variable, but generally consisting of transverse stripes or bars on pale background. From Saharan Africa, eastward to southern Iran. 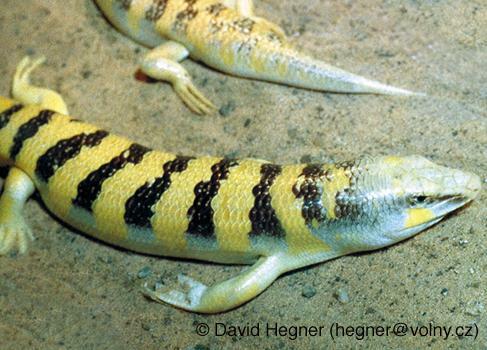 Comment Subspecies: Scincus scincus albifasciatus BOULENGER 1890 and Scincus scincus laterimaculatus WERNER 1914 are now considered as valid species. Distribution: JOHANN (1981) also mentions S. s. cucullatus from Algeria. See map in SMID et al. 2014 for distribution in Iran. 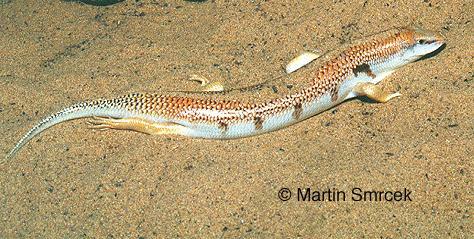 Type Species: Scincus stincus LINNAEUS 1758 is the type species of the genus Scincus LAURENTI 1768. However, GARSAULT 1764 described Scincus earlier and thus DUBOIS & BOUR (2010) designated Scincus scincus var. 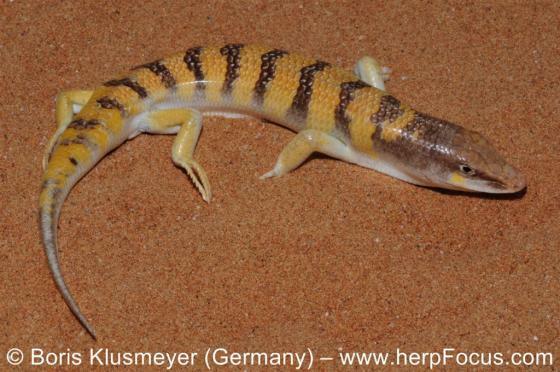 laterimaculatus Werner, 1914 (onymotope: western Algeria), as nucleospecies of Scincus Garsault, 1764. Distribution not corrected after removal of albifasciatus and laterimaculatus.